It’s lovely this time of year. The mornings are cool – today, even, the off-shore breeze gave the water at the beach a glass-textured surface, and the waves broke uncharacteristically beautifully. As I took a break from playing pick-up Ultimate Frisbee yesterday, I noticed the dragonflies, zooming around about twenty feet off the ground. I use to think there were seasons here for dragonflies, and bats. That’s not how it works, as it turns out. The reality is that they each occupy different bits of airspace and during different times of the day. The dragonflies, for example, like it within an hour or two of when the sun is either rising or setting. Bats, of course, like the twilight and later. I wonder if the dragonflies and bats ever even see each other. There are parts of Chennai I never see. The parts I do see I have grown very fond of in a short amount of time. I live in an apartment with a view of the Bay of Bengal that would make real estate developers’ Pintrest boards go wild. I get to walk down it every morning, engaging in a daily gratitude practice with the woman to whom I’m engaged. I see the beach life in the early part of the day – the dogs just waking up and chasing each other around with their morning friskiness. There are the regular cast of characters: the men doing calisthenics routines you’ve seen in grainy black and white filmstrips of PE classes in small town America, circa 1950. There are groups of gray-headed men who sit on the wall at the edge of the road, laughing together about the things that old men at the beach in the morning laugh about. A little ways down are old Indian ladies in their saris, discussing each other’s business with energy and gusto. My favorite character is a short, wiry guy who digs for crabs in the wet sand of the early morning low tide. Last weekend was the end of the Ganapathy festival that I wrote about last year in Be Here Now. I knew what to expect this year, and I had a much easier time being present than before, but the event was just as joyous and cacophonous as ever. Hundreds of trucks lined up with their statues of Ganapathy in the cargo hold, waiting to deliver their patron god to his place in the sea. There are rules that govern this event, but Indian customs, as far as I can tell, often place emphasis on having the last word or the loudest word. And almost no one listens. So when everyone is shouting at everyone else, you’re really in India. 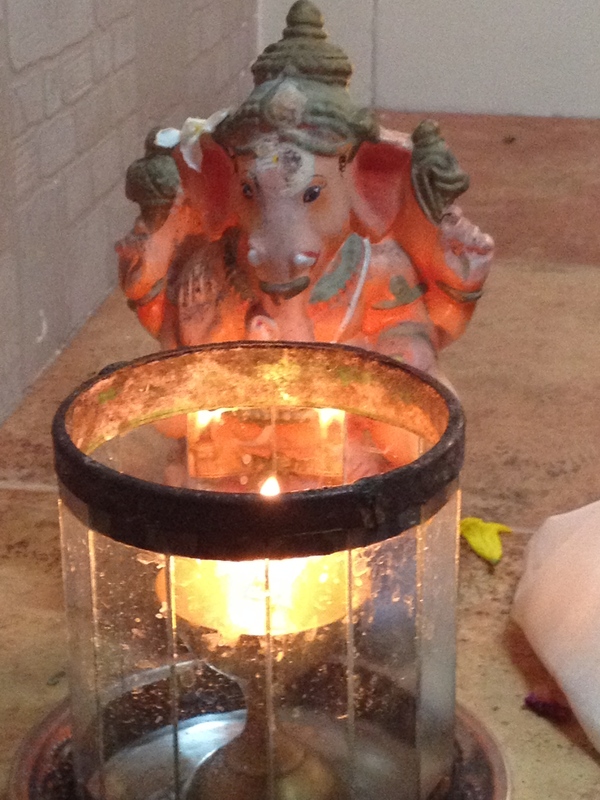 Ganapathy season ended last weekend. I imagine there are people who live in this sprawling city who don’t know that this even exists; to those who are present for it, there’s hardly an experience that rivals it. I think I may leave Chennai with this event chiseled into my top three India experiences: it would top number three, the road trip to the end of the continent that I took last spring with my best friend from high school, but be behind number one: meeting Susannah. India is chaos sometimes, but it’s also lovely. I wonder if the dragonflies and bats feel the epic disorganization and contradictions. I doubt it. They’re probably just thinking, ‘hey, it’s time to eat.’ I can relate. There’s some butter masala paneer waiting for me in the kitchen. There is a lot of love showing in the blog.